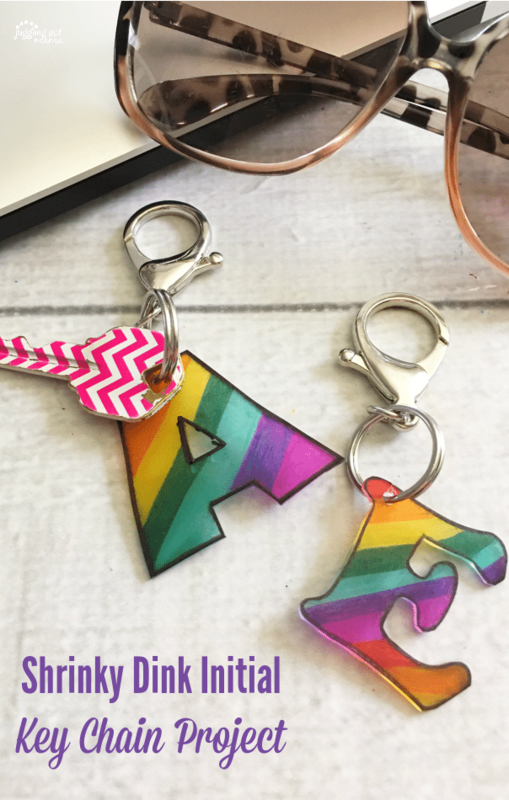 This Shrinky Dink Initial Key Chain Project can be as creative as you are! 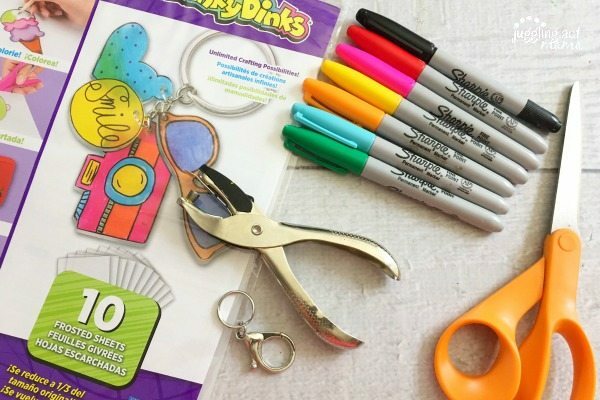 Break out your Sharpie markers and a frosted Shrinky Dink sheet for the super fun and simple project. (You can also use colored pencils, but I think that the Sharpies make the artwork more vibrant.) We made these using our initials, but you can create just about anything you like. My daughter wants to make flowers and butterflies next. 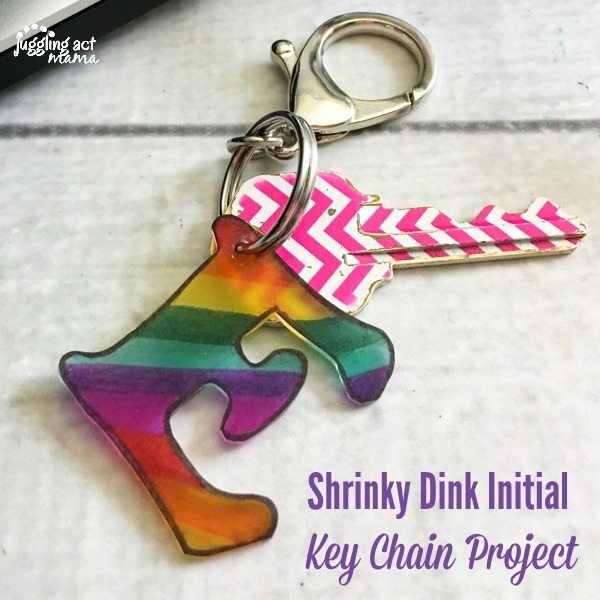 These Shrinky Dink Initial Key Chain Project make a great little handmade gift for friends and family. The kids can make these for Mother’s or Father’s Day, or even swap out the keychain ring for some curling ribbon to make a custom gift tag. Now, this project definitely requires not just adult supervision, but help since you’ll be using the oven. But, it’s definately a perfect rainy day project to keep boredom at bay that the whole family will enjoy! Draw a single 4×4″ letter onto your frosted shrinky dink paper with a black Sharpie (you can even trace one from a magazine). 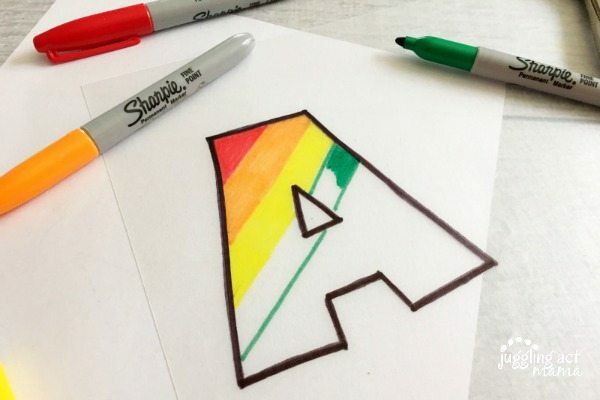 Use your colorful Sharpies or colored pencils to color a diagonal rainbow in your initial. Carefully cut out your initials with scissors, then use a hole punch to punch a hole onto the top of your initial. Place your initial onto a foil lined baking sheet and place another sheet over top, pressing flat. Bake in a preheated 325-degree F oven for 3 minutes. Remove your pan from the oven and immediately press the initial flat with a oven mitt. Let cool and remove from the foil, then place a key chain hook into the hole and attach to your keys. Check out these other great #BoredomBuster Projects & Recipes!